Gil Scott Heron | If you want life to change, YOU have to change! 1 a dramatic and wide-reaching change in the way something works or is organized or in people’s ideas about it. Year after year, people go thru the ritual of thinking up New Year’s Resolutions. Just as common, are the feeble decisions to abandon these half-hearted pledges within days or weeks of the New Year beginning. We don’t need to make more promises that we don’t intend to keep. We need a dramatic and wide-reaching change in the way life works. In the last hundred years or so, we have transitioned from the Agricultural Age to the Industrial Age to the Information Age. We’ve gone from being farmers to factory workers to knowledge workers. A change is upon us once again though. The Knowledge Age is giving way to the Conceptual Age. Knowledge workers are yielding to Creators and Empathizers. A revolution is coming folks. And just as Gil Scott Heron predicted nearly forty years ago, “The revolution will not be televised.” Corporate America is failing us all around. The tale we’ve been fed since childhood about getting good grades to get into a good college so that we can get a good job and live happily after? It’s been rendered a myth. Folklore. Nostalgia. At the turn of the last century, we all were self-employed. In just over a hundred years? We’ve sold ourselves into indentured servitude. We gone from independent to dependent. We now need to transcend to INTERdependence. We have that opportunity to change the way that work is organized. We need to alter our ideas on how to provide for our families, or we will succumb to the on-going decline of the corporate system. Big Brother is no longer here to take care of us. But we are the remedy. In 2010, we are looking for like-minded people who have the dreamers disease. We’re looking for people who want to share a common future of hope and abundance. We’re looking for people who know in their soul of souls that they were made for more than what 2009 had in store for them. The revolution will not be televised. It will happen in living rooms across the United States, in Canada and in dozens of countries around the planet. It will happen in coffee houses and lunch rooms. It will happen on planes, trains and in automobiles. It will happen in parks, at High School Reunions and in chance encounters. The revolution may start with a whisper, but it will triumph with a BANG. It will be doubted by nay-sayers and feared by the ignorant. Some may try to sleep through it, but 2010 is the year for the slumbering giant within us to awaken. Ennui is torn asunder by a single solitary light of determination. The bridge back has been destroyed and there is no where to go but forward. We need to declare that we are sick and tired of being sick and tired. We need to refuse anything less than we were created for. We need to each one, teach one. We need to share like we have never shared before and get out of our comfort zone…THERE IS NO MONEY IN YOUR COMFORT ZONE!!! We are living history. What we have is recession-proof, undeniable and cannot be touched by the government. There is no excuse. You have been advised. The revolution will not be televised, but you can be a part of it. Or you can just look back with regret and wish that you had. This is our New Year’s Revolution. The revolution will not be televised…but it will be blogged. 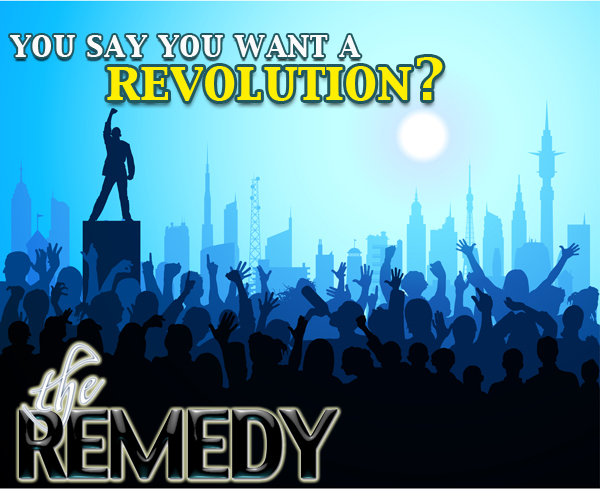 We are the Remedy. Welcome to the revolution.